Bonn, 27 November 2018 - The Taiga Bean Goose (Anser fabalis fabalis) has experienced a long-term decline mainly originating in overharvesting and loss of breeding habitat. Globally the species is categorized as a species of Least Concern (LC) in the IUCN Red List, due to the fact that no distinction is made between the subspecies of Taiga Bean Goose and the population of the Tundra Bean Goose (Anser fabalis rossicus), which is considered stable and much more abundant. However, under the framework of the Agreement on the Conservation of African-Eurasian Migratory Waterbirds (AEWA), the Taiga Bean Goose was upgraded to a stricter protection category allowing hunting on a sustainable use basis only within the framework of International Single Species Action Plan (ISSAP), which shall seek to implement the principles of adaptive harvest management. The ISSAP for the Conservation of the Taiga Bean Goose was adopted at the 6th Session of the Meeting of the Parties to AEWA (MOP6), in Bonn, Germany in November 2015. This ISSAP covers the entire subspecies of the Taiga Bean Goose, divided into four sub-populations or Management Units based on their breeding and wintering areas; the Western, Central, Eastern 1 and Eastern 2 Management Units. Within the framework of the European Goose Management Platform (EGMP), the International Working Group recommended the closure of the hunting season for the Western and the two Eastern Management Units, whereas for the Central Management Unit an Adaptive Harvest Management (AHM) framework has been developed. Based on area-wide datasets the AHM framework produces recommendations for the Range States of the Management Unit on the sustainable level of harvest and potentially the closure of the hunting season. The main concept behind this approach is to flexibly adapt the harvest levels to first recover the population and then maintain the population at a satisfactory level. While there are limited data on population size in the Eastern Management Units, the Range States belonging to the Central Management Unit have joined forces to establish a coordinated data gathering and monitoring system to underpin the AHM framework. Based on a recent population status assessment, it was agreed in 2018 to maintain a constant harvest rate of 3 per cent, in order to provide limited hunting opportunity while recovering the population. “The Taiga Bean Goose is a prime example of a declining population which can still be hunted in a management unit while recovering the population. Sustainable use along the whole flyway has been the key incentive for Range States to invest in the conservation and coordinated management of the Taiga Bean Goose.” Mikko Alhainen, Coordinator of the EGMP Taiga Bean Goose Task Force. The novel and challenging approach of the AHM framework is establishing a way forward to effectively manage waterbird populations at a flyway level. However, it requires full commitment and coordination amongst all Range States of the species. 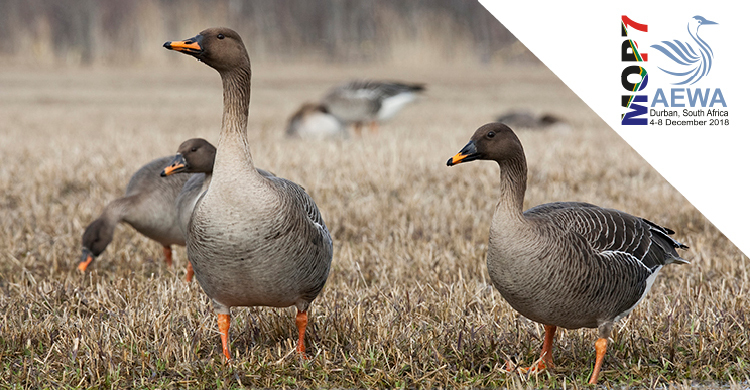 Stay tuned and follow the progress of the European Goose Management Platform to learn more about adaptive management and the coordinated efforts for the recovery and sustainable use of the Taiga Bean Goose. For more information, please contact the EGMP Coordinator based at the UNEP/AEWA Secretariat, Ms. Eva Meyers.